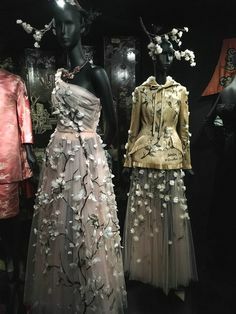 When the V&A first announced plans to reimagine the exhibition that had taken Paris by storm – Christian Dior: Couturier de Réve – there was an element of anticipation as to whether it would echo the beauty of their French counterparts at the Musée des Arts Décoratifs. Two months after opening, Christian Dior: Designer of Dreams is being acclaimed as one of the largest and most comprehensive exhibitions staged on the House of Dior in the UK. Spanning 1947 to the present, Christian Dior: Designer of Dreams traces the history and impact of perhaps the 20th century’s most influential couturier. Immersive and inspirational, the V&A offers a fascinating glimpse into the world of Christian Dior – and his successive Creative Directors – to show how one fashion house created a truly timeless style. What’s intriguing about Christian Dior: Designer of Dreams is the light it sheds on the designer’s fascination with British culture. Inspired by the English garden his mother created at his childhood home in Northern France, Dior’s love of British culture went on to become his ultimate muse, prompting a move to the UK when he was 21. Dior’s career blossomed in Britain, and the following years saw him carving out his reputation on the international stage. After British fashion had been reduced to nothing more than utility during World War II, Dior’s 1947 Carollecollection became something of a revolution itself. Featuring a full-skirted, feminine silhouette, it was this ground-breaking range that dared to reintroduce fantasy to fashion. Christian Dior: Designer of Dreams explores many of Dior’s creative collaborations with influential British manufacturers from this period, such as Dent (gloves), Lyle & Scott (knitwear) and Rayne (shoes). But it is his masterpieces worn by so many notable British clients including novelist, Nancy Mitford, and legendary ballerina, Margot Fonteyn, that best showcase Dior’s love for this country. One of our personal favourites is the dress he created for Princess Margaret’s 21stbirthday celebrations. Of all the 200 rare haute couture garments on show, it is this dress that best exemplifies the polished, feminine, yet highly wearable aesthetic that is the unmistakable blueprint of Dior. Our Marketing Manager, Megan Holloway, particularly appreciates the way style and trend has been presented by the exhibition. Another highlight of the exhibition for us is the Atelier section – seeing the designs in pure cloth, letting the shapes and tailored perfection shine through. As much as we love print and texture, taking it back to basics and focussing on the craftsmanship that goes into each couture piece is amazing to see. Christian Dior: Designer of Dreams shows how truly forward-thinking the designer was, and how the brand became a global icon through his affinity for the British way of life. At Sofa Workshop, we’re also keen champions of our national aesthetic. You can embrace Dior’s love of the English country garden with delicate floral prints like Cathay Bloom, inspired by the V&A archives and printed to order in Cheshire. Or, you can bring the rich heritage of the V&A archives home, through our exclusive collection. Each piece of furniture is handcrafted to order in Long Eaton, with fabric designs lovingly recreated from the original archive pieces. So, be sure to catch the V&A’s beguiling exhibition if you can. You may also want to follow our Dior inspired Pinterest board and become the designer of your own dreams.